TRUCKEE, CA -- Route 267 takes the traveler from the town of Truckee over to Lake Tahoe. On the way, the road flows through Martis Valley and begins to climb up the shoulder of Mount Pluto to Brockway Summit. Off to the right, one can see the trails of Northstar ski area cut into the pine trees and the tell tale signs of the golf course on the meadow below. In 1975, Northstar at Tahoe was carved out of a huge logging tract that was under the ownership of the Fiberboard Corporation. The concept at Northstar from the beginning was to be a full amenity family oriented resort. The ski area’s mellow terrain made it popular with families and stimulated strong interest in the resort. Since it opened, Northstar has become not only a popular resort but also has attracted many residents to the hundreds of home sites available here. Northstar’s location, just six miles from Lake Tahoe, six miles from Route 80, and just three miles from a regional airport, makes it an easy and convenient place for the Tahoe traveler to stay at. The proliferation of ski area consolidation has changed the ownership of Northstar. Today the property is owned by Booth Creek Ski Holdings, which operates other ski resorts in Washington, New Hampshire, and California. Booth Creek has created a bold expansion plan for the resort that will include expansion of the ski terrain, lodging, and improvements of the village over the next ten years. Today Northstar at Tahoe consists of a complete village with 265 on-site lodging units. Accommodations range from hotel-style rooms to condominiums and mountain homes. During the summer months, the resort features a full gamut of activities including the largest mountain bike complex in Northern California with over 100 miles of trails, 10 tennis courts, adventure park, riding stables, ATV Tours, a private fly fishing lake, and, of course, golf. Northstar At Tahoe prides itself in offering something for everyone in the family during their Tahoe vacation. Northstar at Tahoe Golf Course is a memorable track for one reason, its dichotomy of nines. 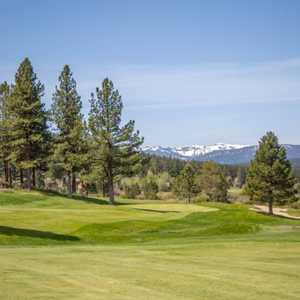 The front plays on the open land of the Martis valley with just small tree edging some of the fairways and the expansive views of the Sierra Crest adding to the sense of playing in the open range. But the back nine twists and turns in tight corridors of tall pine trees in completely different fashion. This is like two different golf courses and has to be approached that way. 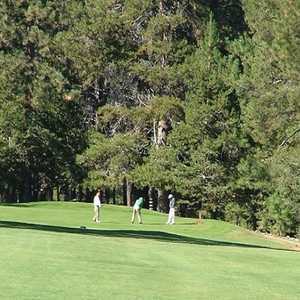 The Northstar golf course was designed by California architect Robert Muir Graves and construction began on this course in 1975. When Grave did the drawings and routing, the resort could only build one side at a time. The back nine that winds through the trees was built first and Graves provided a lot of input in the creations of the tight golf holes. When the nine first opened for play, the premium put on accuracy and club selection made some feel that it was like playing in a pinball machine. But golfers loved the challenge and the thick forest setting. The front nine was added in 1979 and was built in-house without much input by the designer. If there is any sore spot to Northstar, it is the front. This nine is an example of how golf course construction can affect the overall condition of a course over the years. Many corners were cut in construction and not much soil was brought in for stimulating turf growth. The tees were poorly constructed and over the years, dips and pockets have formed and many of the tees created rather uneven lies. The front nine is also wide open and the combination of winds and bright sun really put an added stress to the turf. Because of this, thin patches of turf are evident on several holes, and on the greens, the poa and bent combination putting surface really suffer from the effects of the elements. In the last few years, an effort has been made to correct the original construction mistakes. New cart paths are being added to control stress on the fairways and new sod is being laid in the worst areas. These efforts to improve course conditions have helped to make this nine better. The combination of the two set up a great test of golf. This golf course is a true resort course and the pace of play is directly related to who is out on the course. Some days you can breeze around Northstar in less than four hours while other days you have the time to count the different varieties of birds that are flittering through the trees. It just depends. The course offers four sets of tees ranging from 5,470 yards to 6,897 yards from the tips. The white tees play at 6,015 yards and the blue tees play to 6,365 yards. If your handicap is less than a 10, you can consider the back tees but for most players, the blues give a fine test. There are two creeks that dissect the back nine and they join to flow right in front of the first tee. This opener of 398 yards just asks you to get the ball airborne to be safe as the wide fairway is easy to hit. Once you are out to your second shot, the open expanse of this nine overwhelms you. Martis Valley is huge and offers little protection from the afternoon breeze that comes humming off of the Sierra Crest. Castle Peak is the dominant mountain peak you see to the west and it will catch your attention many times during your round. Even though this is a wide-open meadow, it is surprising that water comes into play on seven of the holes. Lakes and a creek force you to consider your shots at every hole. The scorecard offers a great cheat sheet with tips for playing each hole. Be sure to read it as there are many surprises here that aren’t evident at first glance. Remember also that playing at an altitude of 6,000 feet, the ball can travel 10% farther, so club accordingly. A good example of surprises appears of the 520-yard par 5 2nd hole. After taking your drive out to the left of the fairway bunker, you can’t see the pin of this hole as the green is in a depression across a creek that is also out of view. The smart play from here is a medium iron just past the 150 yard marker that is in the middle of the fairway as the creek cuts through the fairway just 70 yards from the green. If you hit it too hard, it is easy to roll down the bank and into the creek. The huge green is relatively flat, so just hit it close for a great birdie opportunity. Uneven and side sloping lies are a regular feature on most holes out here so you have to be very careful in alignment or you can spray a shot easily. Also it is a good idea to take some time on each tee box to find the most level spot to hit from, as the imperfections here can be drastic. The other par 5 on the front nine, #7, is a tough and challenging hole, playing at 562 yards. From the tee, the hole looks as though it is just straightaway but there is more than meets the eye here. First there is long rough on the right side of the fairway. There is more room left but there is also a lake (once again blind) about 230 yards off of the tee to the left. On your second shot, you are going to hit everything you have and, again favor the left side, as there is actually a water hazard on the right side at about 150 yards from the green. This green has a huge mound in the middle of it so check the pin placement on your approach. The beauty of the mountain backdrop and the prevailing wind all add in to make this a memorable golf hole. After you make the turn and grab a snack, you are ready to change completely. After being out in the elements, the cool shade of the pine trees is, at first, rather refreshing. But when you look up the tenth fairway and see pines on both sides, your love for the forest can change rapidly. Throughout this side, distance and placement are the premiums. You can pretty much cover up that driver, as it won’t see much action back here. On reaching the tenth green you will immediately see improvement in the putting surfaces. These greens back here have already received extensive work and several have been changed in size. Although the surface is predominantly poa, the shade of the trees and better construction of these greens really show through. At 11, the challenge of the back is clear. This hole is only 330 yards long. The bunker you can see is 200 yards from the tee, but the idea is to hit the ball about 185 yards so that you have a good lie for your approach shot. The green sits across a deep barranca with the creek flowing through it. The hillside in front of the green is long natural grass so you have to hit a crisp shot to the green. This precision type of play is necessary throughout this nine. The thick trees add a marvelous atmosphere to this side of the course. The two creeks back here are lined by aspen trees and in the fall their colors add to the experience here at Northstar. Architect Muir Graves made a great effort to blend these holes into the landscape and let the forest dictate the golf holes. A prime example of this is the par 4 16th hole. This downhill hole plays to 376 yards and a long iron off of the tee can roll a long ways here. The green is located across the creek and is well below the fairway. If you get right on your tee shot you have to take your approach over the trees. If you go left you can also get blocked out. The green is a great target as it is surrounded by aspens, the creek , and a bunker. The par 4 17th hole is another that stands out as its fairway is split by a wide cavern of rocks and creek. You can play safe to the right and have a 150 yard shot in or go for the big hit left over the trouble. This hole really gets you thinking as you close out your round. All in all a round of golf at Northstar adds up to an enjoyable afternoon. 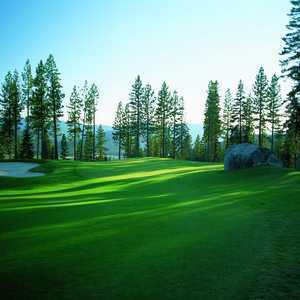 Northstar at Tahoe offers a stay and play golf package that includes lodging and golf at Northstar, as well as at other courses in the Tahoe region. From Route 80 take the Truckee exit to Route 267. Northstar is six miles from town on the right hand side. From Lake Tahoe take Highway 28 to King Beach and turn on to Rte 267. Doug Saunders has covered more than 20 major championships and his unique perspectives on the game have appeared in numerous publications including Golf World, GolfWeek, Golf Course Management, Golf Course News, Golfdom, and the USGA Golf Journal. He is a member of the Golf Writers Association of America, California Golf Writers, and the Sierra Nevada Golf Course Superintendents Association.